In "A Choice of Dooms!," The Brave & The Bold, Vol. 24, No. 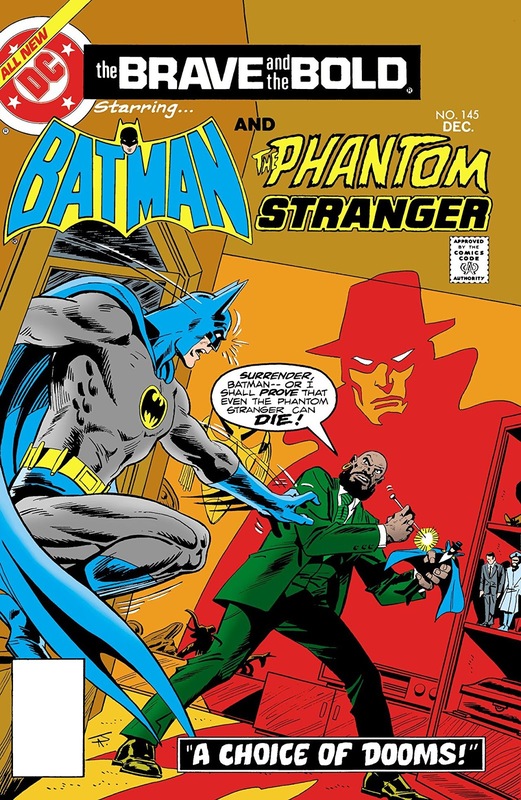 145, December, 1978, script by Bob Haney, art and cover by Jim Aparo, The Phantom Stranger makes his third and final appearance in the comic series. Batman must put a stop to a diamond smuggling ring known as the Ice House Gang. He captures one of them, but the leader of the gang practices voodoo and has an unusual way keeping anyone from talking! 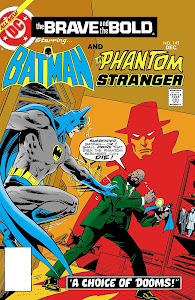 It's up to The Phantom Stranger to come to Batman's aid to defeat this supernatural threat! 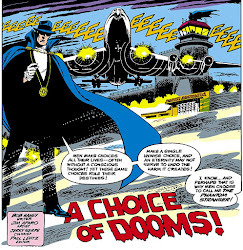 This comic was my first experience with The Phantom Stranger and I loved it! 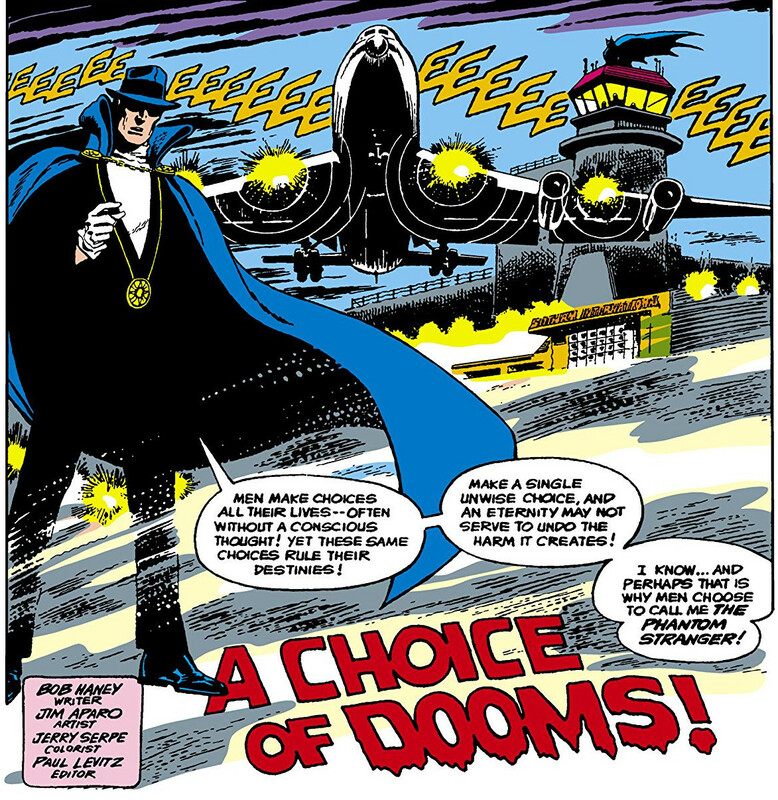 It starts off like a 1970s era mystery/suspense TV show with the Phantom Stranger giving us his opening monologue standing on the runway of the airport while a jetliner screams in! You can just make out Batman in the background lurking on the control tower. 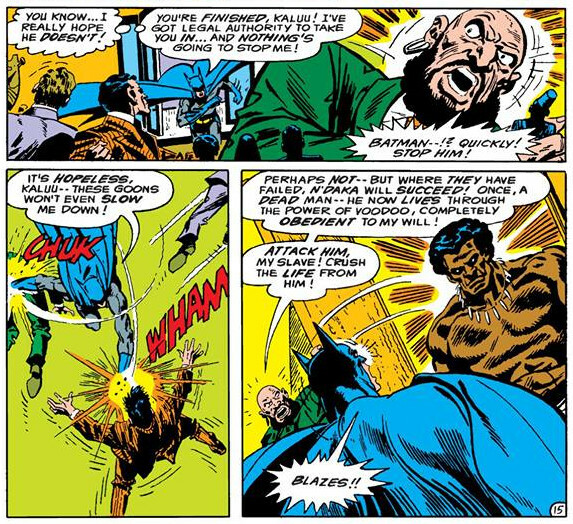 supernatural featuring a stereotypical voodoo priest (Kaluu), right out of Live and Let Die along with his monstrous mindless zombie goon (N'Daka), shoving pins in wax voodoo dolls. Phantom stranger popping in and out giving clues and speaking in riddles. And finally a lesson to be learned: you can't break a spell of fear by being scarier than that which is feared! The power of truth is stronger than the power of suggestion. So does that mean that Kaluu isn't really using voodoo? ¯\_(ツ)_/¯ Don't know. Don't care. A fun outing for Batman and the Stranger. It certainly is a treat to see Jim Apero doing Phantom Stranger again and the story is pretty straightforward with none of those bizarre left turns that Bob Haney's tales frequently have. 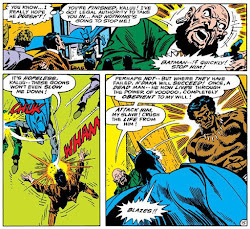 Phantom Stranger + voodoo = win! You can download and read the whole comic as a CBR file by following the link to left. What did you think of the story? Do you have a favorite team-up story from The Brave and the Bold? Sound off in the comments below!